I read some really instructive, informative books last week, and I thought I would share them with you. These books are extremely helpful if you are trying to learn more about our country and government. Note: These books are more adult/high school type books. The first book was The American Miracle by Michael Medved. My thoughts…. This book was Interesting with a capital “I”. Mr. Medved points out strange unexplainable things in the history of our country and takes you through the lives of several prominent figures, including George Washington and Abraham Lincoln to illustrate his points. He shows how the unexplainable miracles can be explained by God’s providence. This was such an interesting book and I highly recommend reading it. The history of the United States displays an uncanny pattern: At moments of crisis, when the odds against success seem overwhelming and disaster looks imminent, fate intervenes to provide deliverance and progress. Historians may categorize these incidents as happy accidents, callous crimes, or the product of brilliant leadership, but the most notable leaders of the past four hundred years have identified this good fortune as something else—a reflection of divine providence. 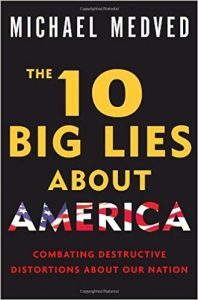 The second was 10 Big Lies About America, also by Micheal Medved. My thoughts…. This one was comforting because I worry about the way America seems to be going. It was slightly depressing in the beginning, though, because Mr. Medved made it sound like America is mostly full of people who choose to believe, and try to make everyone believe, these lies. I liked the history in the book a lot. Another thing I enjoyed is Mr. Medved’s writing style. Instead of an info dump, he writes like he is telling a story. In this bold New York Times bestseller, acclaimed author and talk-radio host Michael Medved zeroes in on ten of the biggest fallacies that millions of Americans believe about our country–in spite of incontrovertible evidence to the contrary. America was founded on genocide against Native Americans. The United States is uniquely guilty for the crime of slavery and built its wealth on stolen African labor. Aggressive governmental programs offer the only remedy for economic downturns and poverty. The Founders intended a secular, not Christian, nation. Each of the ten lies is a grotesque, propagandistic misrepresentation of the historical record. Medved’s witty, well-documented rebuttal supplies the ammunition necessary to fire back the next time somebody tries to recycle destructive distortions about our nation. The third was American Heroes in Special Operations by Oliver North of Fox news. My thoughts…. This one was interesting. I still enjoy reading spy stories and hearing about special forces in the government like the FBI or CIA, and this book teaches about special forces in the military. In tells about several missions the men went through and talks about the war on terrorism. It includes a ton of pictures (no gory ones) and stories about several soldiers who got medals for their bravery. It was so interesting (you know, I think I need to find a new word.). 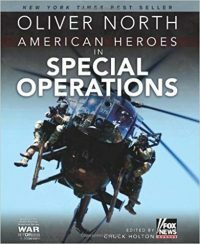 Following the success of American Heroes: In the Fight Against Radical Islam (a New York Times best seller), Oliver North moves from the frontline to the world of shadow warriors, introducing readers to the brave, noble work of Navy Seals, Rangers, and Green Berets in American Heroes in Special Operations. The fourth was Seven Men and the Secrets of their Greatness by Eric Metaxes. My thoughts…. This one was really good. It talked about seven historical figures like George Washington, William Wilberforce and Chuck Colson. I enjoyed learning more about each of these men, and there were several things in there that seemed to be little known about each one. I mean, how many times have you been taught about George Washington? Like a hundred? Mr. Metaxes focuses on why he became so famous and tells things I have never heard before. I highly recommend reading this book. What makes a great man great? In Seven Men, New York Times bestselling author Eric Metaxas explores that most important of questions in through the captivating stories of some of the greatest men who have ever lived. How did George Washington resist the temptation to become the first king of America, and why did William Wilberforce give up the chance to be prime minister of England? What made Eric Liddell cast aside an almost certain Olympic gold medal? What enabled Jackie Robinson to surrender his right to fight back against racists, or Dietrich Bonhoeffer to jeopardize his freedom and safety to defy the Nazis? 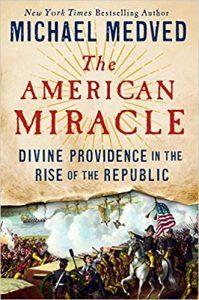 In this stirring and inspiring work, Eric Metaxas reclaims a long-lost sense of the heroic–the idea that certain lives are worthy of emulation. 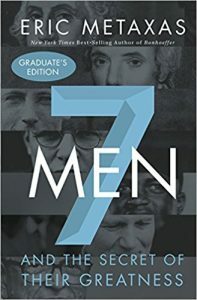 Get to know the seven men in this book, and your life will be immeasurably richer.